I must admit to being slightly apprehensive about this film. Even Marvel Studios, the behemoth responsible for most of the box office take since 2008, seem to have got ants in their pants about this film – we’ve had a more formulaic trailer, a tagline change (from the smart-arse “You’re Welcome” to the schmaltzy “All Heroes Start Somewhere”) and tonight I’m sitting in Crawley, as part of a nationwide premiere event presumably designed to get social media buzz a-going. They needn’t have worried. From the credits sequence (Marvel’s only to date, and therefore the best by default), it’s clear this is going to be a winner. 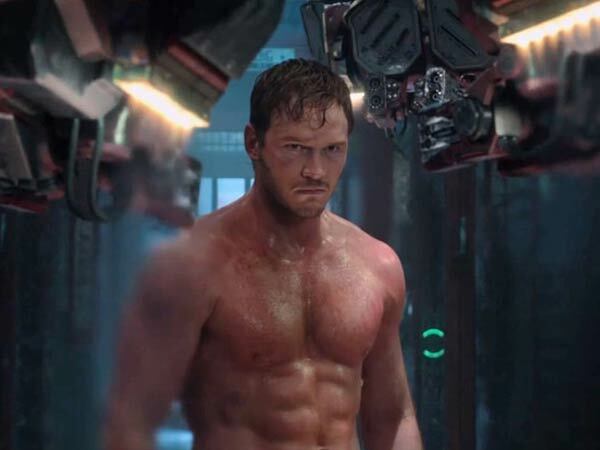 The film is essentially the origin story of the titular band of misfits; a thief (Chris Pratt), an Ent (voiced by Vin Diesel), a creature who looks an awful lot like a raccoon (voiced by Bradley Cooper), a green-skinned living weapon (Zoe Saldana), and a chap who wouldn’t look out of place in a wrestling match watched by Doctor Who (Dave Bautista). They are thrown together in the pursuit of a mysterious MacGuffin which could make them all rich. Problem is, others also want said object for nefarious reasons of their own, and the stage is set for an interstellar jousting match between good and evil. In a Q&A this evening, James Gunn said that Guardians of the Galaxy may be “the most James Gunn film ever”. The fact that he’s accomplished this on a major studio’s tentpole release, rather than the low-budget fare he has made his name with, is nothing short of amazing. The film looks wonderful, bringing to life alien otherworlds and star systems with the visual flair of a much more accomplished director at this level. The script zips along with Gunn’s trademark vim and vigour, albeit slightly sanitised for his newly-found PG-13 audience. Everyone involved is clearly having a lot of fun; Pratt brings his likeable everyman persona to a leading role for the first time and succeeds hugely, Saldana is quiet but pulls out some excellent fighting technique when required; Cooper channels the most smart-arse New York cab driver you could ever meet, and hits the emotional mark more frequently than you’d expect from a talking rodent. Even Diesel brings the vocal pathos he first displayed in The Iron Giant to Groot, infusing a talking tree with warmth and humour. The real revelation, however, is wrestler Bautista as Drax, a man with a sad story to tell. He takes his time but eventually becomes the source of some rich comedy (standing up to accomplished laugh merchant Pratt with ease), as well as some surprisingly emotional moments. It’s the interplay between the five characters which makes this such a fun watch. It does mean that other characters are under-served as a result of developing this chemistry – Benicio del Toro and Glenn Close are woefully underused in their roles, and Ronan the Accuser probably has a good reason for his scheme, but we never find out what it is. The biggest disappointment is probably Thanos – who seems to have been rendered with the leftover CG money that wasn’t used to make Rocket and Groot look amazing. It’s an incongruous appearance from one of the great all-time Marvel baddies and doesn’t really serve the story at all. This is very much an origin story. I got the same feeling walking out of this film as I did walking out of X-Men – that of the start of the story being told very well, but also feeling that there were greater things to come. And despite being slightly rushed at times, this is a great origin story, setting up the group of misfits as an entity currently separate from the rest of the Marvel Universe (save a couple of Easter eggs thrown in for those who are paying attention) and thoroughly deserving of their own adventures. I would have happily sat through a sequel right then and there, I had so much fun in the universe that Gunn has created. And I can’t wait to go back. Guardians of the Galaxy is out in cinemas nationwide on Thursday 31st July 2014. Carole is the latest permanent edition to the Failed Critics Podcast team and can usually be found roaming the streets of London on the look out for unwanted Nic Cage DVD’s. Or on twitter.